As the Senate prepares to take its first vote on the Employment Non-Discrimination Act (ENDA) in over a decade, prominent social conservatives and right-wing media outlets have begun peddling long-debunked myths about the measure, which would protect employees from mistreatment on the basis of their real or perceived sexual orientation and gender identity. It is true that employers will be required to take action against harassers, regardless of whether their motivation is religious or not. There is, however, a clear line between belief and harassment. No one is going to take away your Bible. But you can't hit me over the head with it, either. ENDA cannot tell anyone what to believe, nor can employers. 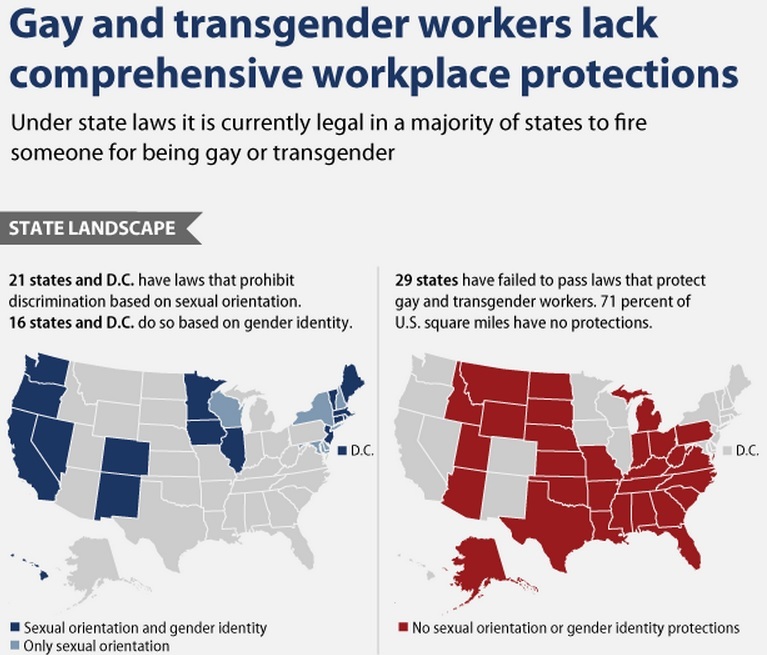 At the same time, gay employees have the right to live free from harassment on the job. In fact, it is now the law and has been since 1964 that people of all religions and walks of life have the right to be free from harassment on the job based on religion. Co-workers who want to march up to you and say "You are going to hell to burn in the eternal lake of fire!" are not be free to do so. Will this prohibit a private employer from having a Christmas tree, because some Christian sects condemn homosexuals? No. Will it prohibit a co-worker from saying "I'm a Christian."? No. But it will prohibit an attack on someone whether that attack is religiously motivated or not. [J]ust as religious organizations may take into account an individual's religion with respect to employment decisions, ENDA's religious exemption allows religious organizations to also take into account an individual's sexual orientation or gender identity. In other words ENDA gives religious organizations a legal right to discriminate on the basis of sexual orientation and gender identity. In fact, not affirming the LGBT lifestyle by remaining silent could be construed as negative bias against LGBT individuals. Opposition locally has been less active than the proponents, but Cornerstone Policy Research (and its political arm, Cornerstone Action) has made its position known. Almost all of the localities surveyed reported almost uniform compliance with the contractor ordinances, with little to noresistance by contractors. Twenty-five of the 29 localities that provided information about their non-discrimination and affirmative action ordinances reported that contractors complied with the sexual orientation and gender identity requirements without resistance. Three of the 29 localities reported just minimal resistance initially but then the contractors agreed to comply when the requirements were explained to them. Of all the localities that responded to the survey, none affirmatively reported that there had been individual enforcement investigations or actions for violations of these contractor requirements. Twenty-eight of the 29 localities reported that no complaints of sexual orientation or gender identity discrimination had been filed under their non-discrimination ordinances. The remaining locality was unaware if any complaints had been made because discrimination complaints were handled by a state agency, rather than the local agency implementing the contractor requirements. In addition, none of these localities reported that contractors had been barred from bidding on future contracts because they did not comply with these ordinances. It is the employers, however, who would benefit most directly from a federal law that clarifies the boundaries of Title VII and establishes explicit protections for LGBT workers. National legislation would allow employers to adapt to unambiguous employment guidelines and greatly reduce the risk of a discrimination lawsuit facing many businesses. Studies show that employers that institute formal mechanisms for avoiding and dealing with workplace discrimination are significantly less likely to see the initial filing of a lawsuit by an employee. Employer-initiated efforts to deal with discrimination can work to preempt legal action, quickly reducing a business’s legal expenses.